This challenge has multiple parts. Ideally participants would be interested in doing more than just one. The challenge is from January 2014 through December. Read the Bible using a Bible Plan. Here is the plan I’ll be using. Choose verses to reflect and meditate on. 1~ Joshua 1:9 Have I not commanded you? Be strong and of good courage; do not be afraid, nor be dismayed, for the Lord your God is with you wherever you go. 2~ Isaiah 53:5 But He was wounded for our transgressions, He was bruised for our iniquities; The chastisement for our peace was upon Him, and by His stripes we are healed. 3~ Romans 3:23-24 For all have sinned and fall short of the glory of God, being justified freely by His grace through the redemption that is in Christ Jesus. 4~ Galatians 5:22-24 But the fruit of the Spirit is love, joy, peace, longsuffering, kindness, goodness, faithfulness, gentleness, self-control. Against such there is no law. And those who are Christ’s have crucified the flesh with its passions and desires. 5~ Ephesians 2:8-9 For by grace you have been saved through faith, and that not of yourselves; it is the gift of God, not of works, lest anyone should boast. 6~ Philippians 4:13 I can do all things through Christ who strengthens me. 7~ Philippians 4:8 Finally, brethren, whatever things are true, whatever things are noble, whatever things are just, whatever things are pure, whatever things are lovely, whatever things are of good report, if there is any virtue and if there is anything praiseworthy—meditate on these things. 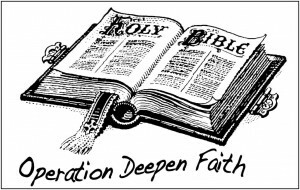 8~ 2 Timothy 3:16-17 All Scripture is given by inspiration of God, and is profitable for doctrine, for reproof, for correction, for instruction in righteousness, that the man of God may be complete, thoroughly equipped for every good work. 9~ 1 John 1:9 If we confess our sins, He is faithful and just to forgive us our sins and to cleanse us from all unrighteousness. 10~ Colossians 3:17 And whatsoever ye do in word or deed, do all in the name of the Lord Jesus, giving thanks to God and the Father by him. 11~ Psalm 95:6 Oh come, let us worship and bow down; Let us kneel before the Lord our Maker. 12~ Leviticus 19:18 Thou shalt not avenge, nor bear any grudge against the children of thy people, but thou shalt love thy neighbour as thyself: I am the Lord. 13~ Psalm 96:1-4 O sing unto the Lord a new song: sing unto the Lord, all the earth. Choose any number of books to read. How wonderful to find others who love the Bible too!